Books on clothes tend to focus on the attire of the glamorous — designers who dressed the most beautiful women of their time, celebrities who wowed the world with their looks, or magazine editors whose pithy comments set the tone for a generation of fashionistas. But what about the rest of us, who still have to get dressed in the morning? 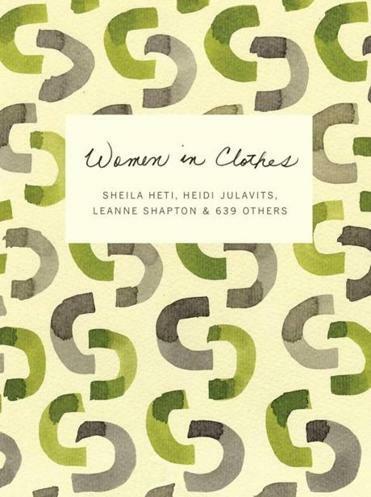 This is the gap that “Women in Clothes,’’ a book edited by Sheila Heti, Heidi Julavits, and Leanne Shapton, seeks to fill. This charming patchwork expands the scope of fashion writing by looking not at forerunners of style but at how those outside the industry think about what they wear. Some of the surveys are printed in full. Others are cut up and arranged in sections about a certain subject — breasts, say, or sisters. Interspersed among the answers are short essays and artwork inspired by the editors’ questions. One of the pleasures of the book is seeing the survey refracted through the women who answered it. A question about lost clothing leads to reflections about mislaid sneakers and stolen jewelry; it also appears echoed in Sadie Stein’s sweet essay on clothes that “had the capacity to transform [her]” and then vanished. The book’s most elegant projects are often the simplest. In one photo series, actress Zosia Mamet, dressed in an eternally passé one-piece outfit, reinterprets poses from fashion magazines of the past few decades. Crumpling on the floor or flexing her biceps, she looks both self-serious and ridiculous — like, one imagines, the clothing these pages promoted once they were separated from the trends of the time. Another series, sprinkled throughout the book, features a single kind of item that one woman owns in multiples — tote bags for one woman, striped shirts for another. The sets of pictures, each arranged in a grid on a single page, suggest the daily rhythm of dressing and preparing to meet the day. In their understated intimacy, they convey what comes across as one of the theses of the book: Fashion may offer new looks every season, but what makes a woman feel good is the clothing she chooses for herself. Women and clothing is an impossibly large subject, and the editors desire to cover as much territory as they can. The range of women involved — 642 according to the editors — is dazzling. The book features single women, stay-at-home moms, artists, nurses, religious women, gay women, old women. Even one 5-year-old answers the survey’s questions. For every celebrity that appears in the book’s pages (Lena Dunham, Tavi Gevinson, Miranda July) there is a woman far from the center of fashion. A soldier in the Israeli army offers sardonic advice for military dress. Two farmers recount how they remain stylish while working the land. The stories these women tell fall outside what is usually related in fashion magazines or runway reports. Their “idiosyncratic and highly personalized beliefs,” as Julavits describes in her introduction, are a welcome addition to writing that often focuses on a single trend for all. But while the survey format makes for interesting sociological reading, it doesn’t always lead to polished writing. One wishes that the women featured had elaborated on some of their answers before moving on to the next topic. What does Jennifer Armbrust mean when she says, “Clothes that list more than one fiber are undesirable?” Why does Masha Tupitsyn think that she “used to paint or clean [her] apartment in [her] best dresses?” “Women in Clothes’’ asks good questions. The answers will hopefully continue trickling in for years to come. Madeleine Schwartz is a writer in New York. Her work has appeared in Dissent and The Believer, among other publications.